Rhino populations are being hammered by poachers, steeping Africa in blood and pushing the species ever-closer to extinction to satisfy the demand for rhino horn in Vietnam and other countries – a demand largely based on the myth of the non-existent medicinal properties of rhino horn. For the record, rhino horn is entirely composed of keratin, also the chief component in hair, nails and animal hooves; you’ve as much chance of curing cancer by biting your nails as you have by drinking powdered rhino horn. Yet despite 668 rhinos being slaughtered by poachers across South Africa in 2012, there are strong indications that the country is contemplating pushing for a legal trade in rhino horn – something EIA contends would only serve to confuse consumers and stimulate further demand, with disastrous results for the rhino. In 1991 a new rhino poaching crisis had emerged, with Zimbabwe becoming a major hot spot. In the state of Assam, in India, rhino poaching claimed 67 animals in 1992 and 70 in 1993. Earlier, EIA’s ground-breaking undercover investigations over two years into illegal ivory flowing from the killing fields of Africa to the smart shops of Hong Kong had provided the key evidence that helped secure the international ivory ban, passed in 1989 by a three-quarters majority of Parties to the Convention on International Trade in Endangered Species (CITES). Poaching of African elephants declined dramatically as the doors were slammed shut on the major ivory consuming markets of the world. However, prominent Southern African voices proclaimed that the ivory ban wouldn’t work because a CITES ban had not worked to decrease poaching of rhinos. Nevertheless, numerous field reports from around Africa confirmed declining poaching, attesting that the ivory ban was working. Why not try to enforce the international ban on rhino horn trade to show that better enforcement could protect rhinos too? EIA decided to launch a major campaign to enforce the rhino horn ban. Hearing of EIA’s plans, WWF in the US decided to file a Pelly Petition on illegal rhino horn trade and submitted it days before EIA’s campaign launch. The Pelly Amendment to the US Fishermen’s Protective Act of 1967 enables the US President to certify any nation shown to be undermining the effectiveness of an international conservation agreement. If the offending nation does not take remedial action within a specified time frame, the President may enact trade sanctions. 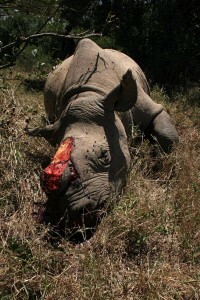 WWF named Taiwan, China, South Korea and Yemen as the biggest offenders in illegal rhino horn trade. EIA’s investigations revealed Taiwan to be the worst culprit, with rhino horns openly displayed in the shop windows of dozens of traditional pharmacies, often with a tiger head displayed next to the rhino horn. Even worse, EIA discovered that a Taiwanese criminal syndicate had bought up six tonnes of rhino horn from illegal stocks held around South-East Asia in order to corner the rhino horn market and drive up prices, which would further stimulate rhino poaching. In November 1992, EIA launched an aggressive campaign directly targeting Taiwan. Several hundred people attended our press launch, including Taiwan’s most senior officials in the UK. Our campaign ad depicted a television screening images of two peacefully grazing rhinos; the TV slowly rotated as gun shots and the squealing of rhinos were heard as blood gushed from the back of the set and the camera zoomed in on the “Made in Taiwan” sticker. Taiwan’s unofficial ambassador jumped up repeatedly to object to EIA’s campaign, causing the audience to loudly applaud EIA’s responses. Three days later, the President of Taiwan banned all rhino horn trade. A further critically important EIA investigation set out to track down the rhino horn amassed by the Taiwanese criminal syndicate and traced some of it to mainland China. senior officials of the company, who took them to a small warehouse and unpacked a tonne of rhino horn. There were more rhino horns in the small warehouse than were left on the remaining live rhino population in Zimbabwe. The Chinese state official was caught on our undercover video stating: “We can get the military police to accompany the delivery of the rhino horn to Hong Kong.” He raised both hands and pointed his index fingers to indicate the guns of the military policy. A vital meeting of the CITES Standing Committee (the governing body) was due in Brussels and the US Secretary of the Interior, Bruce Babbit, announced he would attend. EIA arranged to show the undercover footage at meeting, but first the video was released to news media around the world – ABC national news in the US, Sky news in the UK and Europe, and Visnews in the rest of the world. As we were about to start showing the film, Secretary Babbit walked in and took the US seat that was right next to the Chinese delegation. The Chinese State Council subsequently announced a total ban on the sale of rhino horn and tiger bones. By 1994, the Government of China had seized the tonne of rhino horn and publicly burnt more than a quarter of the cache as a demonstration of its resolve. China invited the Secretary General and the Chairman of the CITES Standing Committee to the burning and China TV broadcast the event to hundreds of millions of Chinese viewers. It was the first time China had publicly responded to an international environmental campaign. President Bill Clinton enacted sanctions against Taiwan – the first time in 30 years that the US Pelly Amendment had resulted in sanctions to uphold an international conservation agreement. Despite rigorous denials of culpability, Taiwanese officials began to enact a crackdown that slowly gathered momentum, not only on rhino horn but for numerous other endangered species. 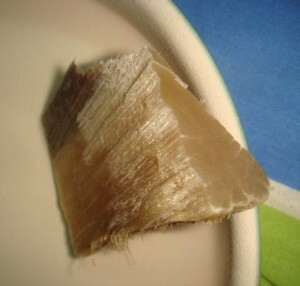 Within two years, EIA surveys in Taiwan and mainland China found that the rhino horn trade had virtually disappeared. 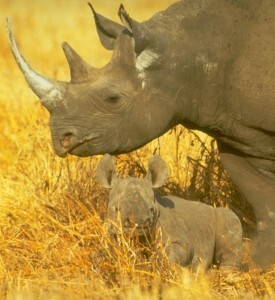 In 1995, WWF observed that rhino populations had stabilised worldwide – some at very low levels but no longer declining. The campaign to uphold the CITES ban on rhino horn trade had worked and would hold for a decade-and-a-half until South Africa began to push for legal trade in rhino horn.